I am always on the lookout for new and interesting things that are food related. So when I heard about a new spice shop that had opened up in the South Hills—Savvy Spices, I knew that I just had to check it out. I am constantly on a quest to find good quality herbs and spices because I cook and bake so frequently. Really good quality spices are hard to come by—trust me because I have scoured the city looking for them. I was curious and I wanted to see what made this shop so different than the others that are around. As I drove up to Savvy Spices, I was warmly greeted at the door by the owners, Dave and Deb Johnson. They asked me if I had any questions and wanted to know if I was looking for something specific. I looked around the shop, taking in all of the sights, the sounds and the smells. The aromas flowed; it was as if my sense of smell was on overload. I did not know which new and exotic spice I wanted to smell first. Dave and I chatted while he showed me some of the unique aspects of this amazing store. I seemed to have a plethora of questions to ask him. Dave and Deb are the owners, but they are also the designers of the custom blends combinations that they have in the store. They are both gastronomes who love to cook and experiment with food and spice amalgamations. Deb has a chemistry background; she is a former chemistry teacher. She has a passion for cooking with a vast knowledge about spices and their relationship to food. Dave has a chemistry background as well. He shares the same love for cooking as his wife. They take their knowledge about spices one step further; they know these spices as a spice anthropologists would, including history, usage and origin. Dave strives to find the finest quality spices available because that is what he and Deb like to cook with. This includes traveling around the globe to find these spices as well as doing research on them. What is impressive about this spice duo is they know about every spice that they have in their store. However because of their foodie side, they can also tell you how to cook with it and how it can be used in a recipe. They have developed recipes for their customers demonstrating the various uses of their spices, including several for their spice and herb blends. I asked them about a spice that I have had trouble locating and that I can only get back home in New England, it is called Portuguese Allspice. Despite their intrinsic knowledge about spices, they had not heard of this type of regional seasoning. Dave and Deb were stymied. Immediately they went to work searching their references to find out more about it. Deb consulted her big book of spices; Dave began searching on the internet. “This is the only shop in town doing (this type of) custom spice blends,” he assured me. I was awe struck by this. At this time, I watched as a customer had come in to pick up a special order spice blend. Dave told me that he just had made a blend for a client and that this is what makes his store unique. He can do this for his customers where other stores cannot. Savvy Spice is a different type of spice store because it custom blends spices by hand for a customer and tries to find exotic spices for consumers who have trouble locating them. This is like a foodie’s playground, a dream come true. Dave told me that he “hand blends all of their spice blends in small batches.” There are only a small number of bottles and containers on the shelves in the shop. By doing this, it avoids spices sitting around and becoming stale. “Once again this is something no other local spice shop is doing,” he tells me. The standard spices are available and they are very good. For example the dried oregano is so fresh smelling and bright, much like the dill and the chives. The vast array of salts that are in stock is amazing; everything a person will need from baking to barbecuing and cooking. The Smoked Salt is divine, perfect for the added smoky flavor in a dish. The same could be said for the peppercorns as well; black, red, green, pink, white and Szechuan. The chili pepper selection is magnificent; the Indian crushed red chili, is insanely spicy and not for the faint of heart. I spotted the saffron, and it is the Valencia Spanish Saffron. This is not packed at the store, but brought into it. This is beautiful Spanish saffron that is brightly colored; it will be a perfect addition for my risotto. Then I came upon the Bourbon Madagascar Vanilla Beans and I was stopped in my tracks. These are the most beautiful and fragrant vanilla beans I have ever seen. They are sublime. The smell of vanilla is so strong with these beans, they are firm and moist and the best I have found. I thought of all of the wonderful things that I would make with magnificent vanilla beans. I was intrigued by their custom herb and spice blends. There is an entire section in the store devoted to this. There are common everyday blends as well as many others; Chili Powder, Lemon Pepper Blends, Poultry Seasoning and Herbs de Provence. I noticed there was an array of blends made for all types type of cooking; French fry Seasoning, Garam Marsala, Gumbo File (Cajun), Jamaican Jerk Seasoning, Tailgate Grillin’ Spice, Vegetable Dust and Tuscan Spice Blend and many others. Deb pointed out that the Tuscan Spice Blend is their best seller and it is a great to dipping spice. Now she had my attention. 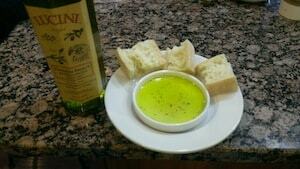 Good olive oil sprinkled with spices and then you dip crusty Italian bread into it. Yes that is my kind of dish. I knew that I had to try this spice blend. I gathered my treats and headed home. My mind was wondering what I was going to do with my new treasures, especially my new dipping spice. I drove past the bakery and bought a loaf of Ciabatta bread. I would try it out tonight as soon as my husband got home. That night, I eagerly dove into the new spice blend. I dipped my bread into the extra virgin olive mixed with the Tuscan Spice Blend, and it was really, really, very good. The mix of spices, combined with rich olive taste from the oil was divine. It was the perfect accompaniment with Ciabatta bread. However, my mind began to wonder what else I could make with this and immediately I knew; Italian Peasant Bread Pizza. When I was growing up, my mom and Grandmother would make bread pizza for my brother and me. It is a simple dish, a true peasant delight. They would take stale Italian bread (rolls) cut in half, slather tomato sauce and spices on it, sprinkle it with some olive oil and grated Italian Cheese and bake it in the oven until golden brown. I knew that this Tuscan Spice Blend would be perfect in this recipe. Later that week, I made the Italian Peasant Bread Pizza for my family and it was absolutely delicious. The spices worked so well with the tomatoes, cheese and bread, it really was the perfect combination. I made it 2 ways, one plain Italian cheese and one with pepperoni and mozzarella. Both ways came out great. This is a terrific dish to make; a perfect snack, appetizer or light dinner. It is versatile and forgiving dish because almost any toppings or bread will work; you are only limited by your imagination. 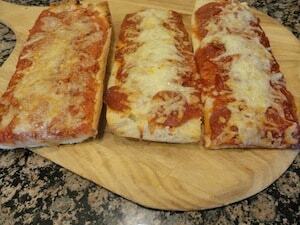 I am sharing with you my recipe for Italian Peasant Bread Pizza. Heat oven to 375-400 degrees Fahrenheit. Heat olive oil on a medium heat in a small pan and add tomato sauce. Season with salt, pepper and sugar; cook for several minutes, adjust seasonings to taste. Split the bread in half horizontally. Place bread halves, cut side up, on a baking sheet. 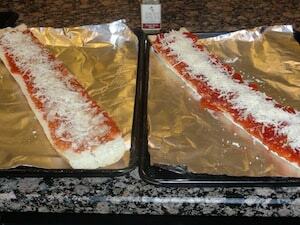 Spread each half with a thin layer of tomato sauce. Sprinkle with Tuscan Spice Blend. Sprinkle with grated Italian cheese. Add sliced pepperoni and top with mozzarella. Bake in preheated oven until golden browned, about 15 minutes. Cut into slices and serve while hot. For more information on Nicky D Cooks, check out my webpage at www.nickydcooks.com or facebook page @ http://www.facebook.com/nicky.d.cooks or like my fan page @ Nicky D Cooks Foodie Fan Page for more information and great recipes..